AG Tire Talk is proud to present a new platform, enabling AG Tire Manufacturers to weigh in on and help growers solve tire related issues. Every other month, AG Tire Talk will pose ONE Question to AG Tire manufacturers, asking them to provide answers to attain optimum equipment performance thru tires. In sprayer application, what is your recommendation to improve driver comfort and reduce road lope? When the machine is not in the field with a current crop, purchase and use the OE approved flotation tire with a width of 520mm (20.8”) to 800mm (30.5”). These flotation tires don’t just have more footprint area, but because of their extra width, they are able to carry the same load as the narrow tires at a lower inflation pressure. This helps reduce soil compaction when the machine runs in wetter conditions. When using the machine in a field with growing crops, choose a narrower tire width of 320mm (12.4”) to 420 mm (16.9”) to minimize crop damage. 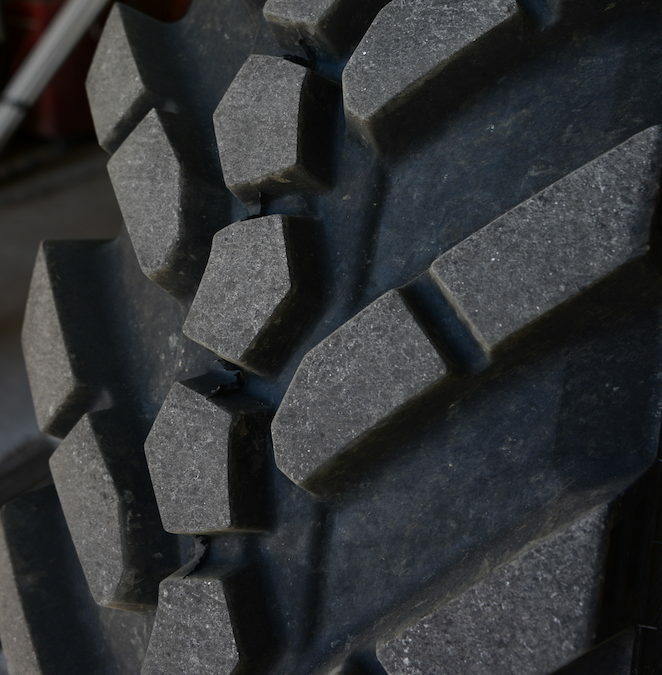 Firestone Ag recommends using the widest possible tire to minimize soil compaction. IF- and VF-marked tires carry more load at the same inflation pressure as the same-sized standard radial tire. In some cases, IF and VF tires (especially in the narrow tire configurations) are the only tires able to properly carry the load of the sprayer. Don’t travel down the road with product in the tank. If there is liquid in the tank, especially half a tank, the liquid will shift when there is a change in direction or speed. If an operator is traveling down the road and turns or brakes unexpectedly, the shifting liquid can result in the sprayer being hard to control. Road lope occurs when the wheel assemblies have a high and low spot. When changing tires on these machines, it becomes important to make sure the tire/wheel assemblies are concentric (centered on the centerline of the axle) to prevent road lope. It doesn’t matter what brand or type of tire it is: if the wheel assembly isn’t concentric, the sprayer will lope when the machine operates between the 18 to 24 mph range. Even with just a quarter-inch of runout, a customer can feel the road lope. Usually it takes only a ¼ inch of runout to cause road lope that a customer can feel. On sprayers, eliminating this quarter-inch of runout is easy to achieve when we change our tire configuration (putting the narrow tires on in the summer). Firestone Ag recommends that customers check the runout when they are putting the assemblies on the sprayer. It will take only take an extra 10 to 15 minutes to complete the check for each tire, but it is worth it in operator comfort. Tighten the tire assembly axle and keep the tire off the ground. If the sprayer has fenders, the measurement can be taken at the 12 o’clock position between the fender and tire. Using a ruler, start measuring the distance between a lug at the center of the tire and the stand/fender. Record this distance. Start rotating the tire and measure the distance of every other lug and record the values. After rotating the tire 360 degrees, review the distance values. If all the distances are the same value, the assembly is concentric. If the values change as the tire rotates, then the assembly is not concentric and we need to center the assembly. Slightly loosen the lug nuts so the assembly can drop to the bottom of the lug bolt holes. Retighten all the lug nuts and recheck the runout. Once the assembly is concentric, properly torque all nuts and move to the next tire. Following these tips can help the overall feeling of the machine as it travels down the road. Firestone Ag also encourages customers to check inflation pressures daily to make sure the tire has the proper inflation pressure to carry the load. Road lope is produced when equipment bounces during transport, forcing the driver to reduce speed. Tire quality, design, and incorrect end user usage are a few causes of road lope. There are many solutions to solve the issue. Tire technology has evolved at a rapid pace, changing the mindset of tires being a “black doughnut” to a complex and fundamental part of equipment. As agriculture equipment has grown over the years in size and weight, users have requested a larger footprint for less compaction to protect their farm land. This has also been a trend for sprayer users to request width options to minimize damage to the standing crop. As a solution to this issue, VF (Very Flexible) technology was introduced and allows for an increase of 40% on the load capacity at same pressure and speed or a 40% reduction in inflation pressure at same load and speed. As we know, the load capacity of a tire is dominated by the volume of air in the tire. The more air at higher inflation pressure – the higher the load carrying capacity. This is the reason why sprayer tires have been evolving not only to incorporate VF technology, but also to introduce higher aspect ratios, for example the 380/105R50, keeping the same width and rim size but higher load capacity. This characteristic, combined with very flexible side walls increases the contact area and ride comfort. Sprayer tires, like Mitas brand, follow the R1 definition for faster lug cooling under extreme conditions, 20% less lug height than R1W, with more lugs at a 45 degree pattern to increase the contact for reduced soil compaction. With these definitions out of our way, the first point to check is the quality of the rim and tire and how they work together. Rims and tires are not 100% perfectly round and have a point marked as the high point. The higher the quality, the lower this “high point” is, and quality tire manufacturers, like Mitas, test every tire and perform a RRO, Radial Round Out, test in order locate and mark this high point. Same with the rims where the manufacturer also controls the correct alignment at the hub mounting area. During assembly, with the bead area correctly lubricated, the mounting technician aligns the two marks in 180 degree opposite ends so the high points even out each other. Very important during assembly is the correct lubrication of the bead area and bead seating are of the rim to assure a complete and correct tire bead seating on the rim. Next step is to inflate the tires to the correct pressure and check them periodically. Tires are not 100% air tight so it’s very important to check each tire pressure frequently to assure optimum performance. Best practice is to load the equipment to the max weight and check the load on each tire. Once we have these values, use the manufacturer’s inflation pressure table to establish the correct inflation pressure for that load. It is possible that the operator will find out that not all the tires will have the same pressure and that is acceptable. Sprayer weight is not always balanced between left to right and rear to back. So it is acceptable to have different inflation pressures in each tire if it follows the manufacturer’s tables. An additional point not mentioned often is the cold start in the morning. It is not recommended to leave equipment fully loaded during the rest time, as the tires tend to “flat out” when they are not turning. To reduce this effect, let the tires run for a short period before loading and transporting. This “flat out” will disappear as soon the tire reaches operating temperature and rolling. In summary, the best way to resolve the issue of road lope is to ensure use of the correct inflation pressure. A smooth, comfortable ride is better for sprayer operators in two important ways. On an immediate level, it reduces driver fatigue, which helps keep their reflexes sharp and their driving safe. And a machine that doesn’t shimmy or bounce down the road is much easier to control, which helps keep everybody safer. On a longer-term level, studies of equipment operators in other industries have found that oscillations at 4 to 8 vibrations per second transmitted by machinery from the ground surface can be amplified by the driver’s body, which can cause back and joint pain. High-amplitude shocks—like a jolt from hitting a rut in the field—can also contribute to injury and strain. At the Alliance Tire Group, Inc. (ATG), we’re addressing ride quality and rode lope sprayers in several ways with our Alliance Agriflex+ 363 VF row-crop tire. You’ll see a similar tread pattern in our Alliance 550 Multi-Use R-1 tire, and you’ll notice some of the same concepts of a high-density central bar and level footprint in our Alliance 380, 390, 393 and 882 flotation tires. Just as important as the tread pattern, the 363’s VF (very high-flexion) sidewall also minimizes both high-frequency and high-amplitude vibration. The flexibility of the sidewall is a natural damper, and the 363’s extended bead filler directs more force to the sidewall where it can be absorbed. Road lope is also a comfort, safety and fatigue factor. One thing you can do to minimize road lope is make sure you’re operating at the proper tire pressure. You can address this by weighing your equipment when it’s fully loaded with spray and fuel, then following your tire manufacturer’s specifications for proper inflation pressure at that load. A little time spent setting up tires correctly can not only eliminate road lope, but it will help ensure that your sprayer performs at its peak efficiency. You can also ask your tire dealer to make sure your tires are mounted in a way that minimizes road lope. At Alliance, we look at every aspect of what our tire has to do on that sprayer—not just the need to bear the load of a heavy machine and a full spray tank, but the need to keep the driver as safe, comfortable and productive as possible in every situation he or she is going to face during a long day at work. Michelin’s patented VF Ultraflex Sidewall Technology allows the Spraybib to perform at ultra-low air pressures while carrying the same weight as standard tires. Lower air pressure provides superior driver comfort, a much longer footprint for greater traction, and the ability to handle exceptional load capacity (ranging from 173/14,330lbs load range to 179/17,086lbs load range) at up to 40 mph. As for road lope, if the air pressure is properly set with regard to the maximum loaded weight of the machine, it is a non-issue. All Michelin Agriculture representatives carry a set of 2 scales to provide customers peace of mind, knowing their air pressures are correct and tires are adequate for the application. Additionally, the practice of dialing in air pressures to the machine and application will boost overall performance by optimizing footprint, traction, rider comfort, reducing fuel consumption, improving wear, and overall control of the machine. There are several factors that will cause road lope and ride discomfort in sprayers. Sprayers have a high center of gravity, can run at speeds of up to 40 MPH, and are heavy (especially when hauling liquid). It is always advisable to use IF and VF tires when running the narrower cross section tires. The “IF” will carry 20% more weight at the same air pressure as a standard tire. The “VF” will carry 40% more weight at the same air pressure as a standard tire. This will give the sprayer the proper weight carrying capacity for the tires, and minimize the tires squirming while transporting. It is best to transport the sprayer empty and fill the tanks at the field. The liquid sloshing in the tank while transporting can make the sprayer hard to handle and difficult to stop. Correct air pressure settings are important for a good ride, minimizing ride discomfort, and ensuring that the tires will carry the load. Add the weight of the machine to the weight capacity of the tanks to get a maximum weight that the tires will have to carry. Set air pressures accordingly to the total weight the tires need to carry. It is best to weigh the sprayer fully loaded for accuracy if scales are available. It is important to periodically check air pressures in the tires to ensure that they have the correct amount of air to carry the weights that are demanded of the tires. Since tire liners are not 100% air tight, air loss will occur over time. Ambient air temperature also effects air pressure. Road lope can be caused by tires that feel “out of round”. Generally, this is caused by the high and low spots on the tires and wheels not being matched up. No wheel or tire is perfectly round. Both have high and low spots. The high spot on the tire needs to be matched with the low spot on the wheel, or vice versa. If this problem exists, the tire can be deflated, and turned on the wheel 180 degrees to try to remedy this issue. Road lope, vibration, and a sway from side to side can also be caused by the bead of the tire not being properly seated to the rim. When inflating the tire, visually check the bead and wheel to ensure that the tire is seated to the wheel uniformly. Make sure that the tire beads are properly lubricated when mounting to affect a good seal and eliminate bead damage. Road lope can also be caused by the wheel not being “concentric” on the hub. The wheel has to be centered on the hub. There are two ways to do this. Jack the tire up off of the ground where it is free spinning. If the sprayer has fenders, you can measure the distance from the tire to the fender. If it doesn’t you can use a block of wood placed at the base of the tire. While rotating the tire, measure the distance on every 2nd to 3rd lug. If the distances are all the same, the wheel is concentric. If the distances are not the same, turn the lug with the closest distance to your point of measurement, to the 12 o’clock position. Loosen the lugs, the wheel will drop down, and retighten the lugs. This should make the wheel concentric with the hub. The other way to correct this is to buy or make a couple of concentric centering lugs, and use them when mounting tractor and sprayer tires. The concentric lugs center the wheel on the hub when mounting. In summary, If the air pressures are set correctly, the beads are seated on the wheel, the wheel centered on the hub, and the high and low spots to the tire and wheel matched up, this should eliminate any causes for vibration and road lope. BKT builds the Spargo for sprayer applications. The Spargo is “VF” rated and is built with 45 degree lugs to give it outstanding traction in the field and an excellent ride while driving on the road. There are numerous theories as how to improve driver comfort in self-propelled sprayers. If you think about the application you have an operator sitting 10 ft. in the air on a machine that could weigh close to 50,000lbs, attempting to travel hundreds of miles on 4 tires typically no wider that 15 inches inflated to 78psi in most cases, at 35mph. That is a challenge. The first thought is to drop inflation pressures. With advent of IF and VF technologies the tire industry has allowed higher deflections, 20% and 40% more, which naturally creates a “softer” ride. Although in many cases the lower inflation does soften the ride it may create more issues of road lope. In addition, the increased deflection creates a reduction of lateral stability on the machine. The operator may feel uncomfortable with the “squirm” and instability of the machine when traveling not only on the road but in hillier conditions in the field. There have been reports of VF tires rolling off the rim in these conditions. Titan’s LSW technology in sprayer applications address both of these issues. Lower inflation pressures for ride comfort combined with the lower sidewall reduces loping and increases lateral stability. Whether it be in a float option like our LSW650/60R42 replacing the 650/65R38 or the LSW380/75R50 replacing the standard 380/90R46. In both cases the LSW offers a real option for those operators looking for the best of both worlds.